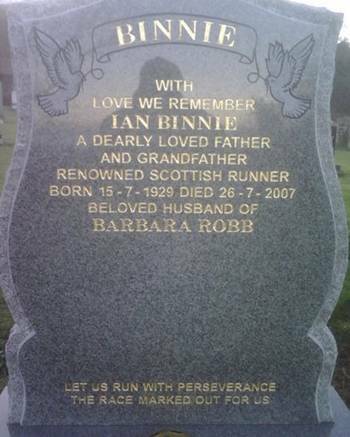 Ian Binnie was one of Scotland’s greatest ever distance runners. He didn’t like cross-country although he was part of the great Victoria Park Cross Country team that won all there was to win in the 1950’s and twice represented Scotland in the ICCU Cross Country International. He really excelled on the track and on the roads. Unusually no one to my knowledge ever said that he should have tried the marathon although it is a common enough remark about most talented road runners. It was probably realised that he was such a real gem in the longer middle distance races as we will see and he was appreciated for what he was. He knew how good he was and times came across as arrogant but he knew his own mind. He always kept his word – on the occasion when he ran his superb one hour run at Cowal, he was phoned at home on the Wednesday before the race by Jack Crump of the AAA’s telling him he had been chosen to run for Britain on Saturday at the White City. he told Mr Crump politely that he couldn’t do it because he was running at Cowal Games that weekend. Crump was furious that he had turned down a GB vest! More of that below but he told me the story himself. He was easily recognised as he ran in the streets and roads around the West End of Glasgow and Dunbartonshire – in summer along the Great Western Road Boulevard with no vest or T shirt, the tan testifying to the amount of running done in that fashion, in winter he wore the VPAAC vest and I even remember seeing him running a la Gordon Pirie in working boots. The last race I personally saw him run was a Three Miles at Scotstoun well after his best days and he broke away with Alex Brown of Motherwell YMCA. Alex was leading and after seven or eight laps, still within a yard or two of Alex, he stepped off the track. He wasn’t going to have a time as slow as he thought that was going to be recorded. A loyal Vickie Parker he made several disparaging remarks about most clubs but particularly about local rivals Clydesdale Harriers – but in the mid 1990’s, when Clydesdale were running much better than VPAAC, he took time to come and speak to some of the CH runners in the Kelvin Hall: sitting on the floor in the gallery with six or seven young athletes (mid twenties) he talked about training and racing for over half an hour. My first encounter with him was when four Clydesdale Harriers were having a meal at the old Whitehall Restaurant in Glasgow one Saturday night when another four guys came in and immediately the two tables were involved in banter throughout the meal. I had just joined the club and was there with Johnny Maclachlan and Neil Buchanan and some other guy and the four at the other table included Binnie and Albie Smith. It was an interesting evening. There are many stories about him – for instance the fact that the rules for the Edinburgh to Glasgow Relay were changed twice because of him. One time he handed the baton to a small boy on a bike to carry while he ran, only taking it back in time for the changeover. The rules were amended to state that ‘the baton must be carried’. Fine, he then had a pocket sewn into his vest where he stowed the baton until hand-over time. The rules were altered again to ‘the baton must be carried (ie in the hand). There was the year when he took the E-G trophy back with a knitted VPAAC vest on it because they were going to retain the trophy and he wanted it properly dressed. At another time he didn’t bother to bring a trophy because they were going to win it again! Anyway, we can start here with a contribution from club-mates of his – Hugh Barrow and finish with the obituary written by Doug Gillon in 1997. The picture below shows Binnie running with the best in the world. In 1985 Hugh Barrow wrote a tribute to him in the Scottish Marathon Club magazine and it is reproduced below. One of my earliest memories of the time that I joined Victoria Park in the late 1950’s was of this most enigmatic of runners, Ian Binnie. Bin, as he was called by the other runners, had an approach to training similar to the attitudes to be adopted later by David Bedford. Ian worked on the premise that you did more than your rivals and you did it faster. At a time when most Scottish distance runners would train three or four times each week plus a Saturday race, Ian Binnie would train at times three times each day and these sessions were not done at what could be described as anything approaching easy running. His idol had been Emil Zatopek and he modelled his methods on the same prodigious amounts of work. When Ian had completed his evening track sessions eg 20/30 times 300 some body might question him about the fact that he had also been seen out at lunch times, but back came the reply that these sessions did not really count. Always secretive about his training it is now sometimes difficult to distinguish fact from legend but what cannot be disputed is that Ian Binnie trained at a cruel level even by present day standards. He set himself very high standards, some might have said unattainable standards, but that was the measure of the man. He wanted to hold every Scottish Record from the mile to the marathon and he only failed by these two. Possibly his finest run was in 1953 against Gordon Pirie at the White City, London, on the night that Pirie broke the World Record for Six Miles. Ian recorded 28 minutes 53 seconds and how many Scots would today beat that time. He only knew one way to run and that was from the front, often setting a suicidal pace. His critics often drew attention to this and his lack of finishing speed just as the same people criticise Ron Clarke and Dave Bedford but they could not criticise his courage. he was a member of the very successful Victoria Park teams of the 1950’s, a team that won the Edinburgh to Glasgow Relay on eight occasions, the first Scottish club to win the English National Cross-Country Championships (only Shettleston Harriers have emulated this performance) and came third in the London – Brighton Relay. Never keen on Cross Country running, Ian put in many brilliant Road Relay legs against such as Joe McGhee of Shettleston and Joe Connolly and Harry Fenion of Bellahouston. The records speak for themselves but to a young hopeful it was more the way he went about his running that remains in the memory. On asking advice one evening, the reply came back, “If you can’t keep up, don’t come out!” On reflecting back now over some twenty five years of running, that advice still seems quite sound. The comment at the end of the article to the aspiring runner is similar to some of Alastair Wood’s in Aberdeen (Do yourself a favour, go to the pictures) and Binnie was famous for such retorts: “No matter how much you polish a bit of wally glass you’ll never make it into a diamond” for instance and his “Sorry Mr Crump, I’m running at Cowal Games on Saturday!” was a bit of lèse-majesté! Remember that these times were run on cinder tracks and without all the improvements in kit – shoes in particular – that modern runners have. In addition the SAAA Championships ran the 6 Miles on the Friday night and the 3 Miles on the Saturday afternoon. So no time trials with pace makers at selected venues: in these circumstances, how would his times stand up 50 years later? Well in the Scottish Rankings for 2008, he would have been placed fourth in the 5000 metres and first in the 10000 metres. As David Coleman might have said, “Quite remarkable really!” The best source of day-to-day information is ‘The Scots Athlete’ and I’ll be quoting liberally from that but first let’s look at his career chronologically. 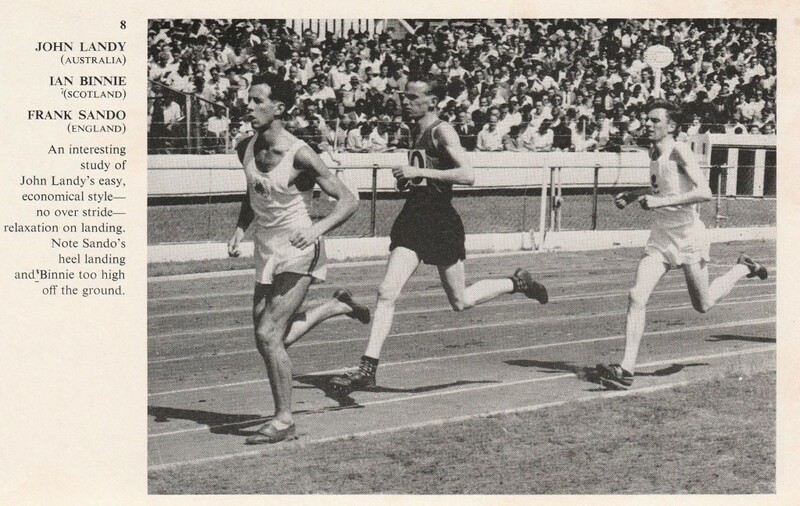 ‘The Scots Athlete’ first mentions him in the results of the Dundee Kingsway Relay and the McAndrew Relays in autumn 1950: he ran first leg in the McAndrew Relays under the name of G Binnie and had third fastest time of the afternoon; two weeks later he was in the Kingsway Relay for the A Team and finished third in the second fastest club time and fifth fastest overall but was listed as J Binnie. In November he ran in the Edinburgh to Glasgow where he was on the first stage again and finished fourth but the comments on the winning eight said of him: “one of the up-and-coming youngsters of the team, and one who has shown distinct promise over country, road and on the track. Joining the club just last winter he is one of this year’s winning ‘four’ in the McAndrew and Kingsway Relays. A leading member of the club’s successful 2 miles track team last summer. Keen and conscientious in training, Ian will go far in the sport.” Not a lot more was written and he did not run in the National at Hamilton where his club won the title. 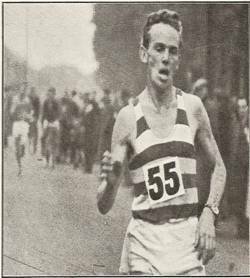 Summer 1951 saw him win his first championship medal with a third place in the SAAA 3 Miles behind Andy Forbes (14:28.8) and Tommy Tracey (14:47.1) with Binnie timed at 15:5.6 – there were many comments about the heavy nature of the wet track and how it slowed all the times on the day. The ‘Scots Athlete’ ranked him fourth in their 3 Miles ranking list behind Forbes (VP), Tracey (Springburn) and AT Ferguson (Highgate). The following winter he had another good run in the McAndrews on the first stage for the winning team and then in the Edinburgh to Glasgow he won the first stage with a huge gap – 26:55 to 27:49 over Andy Brown of Motherwell. Emmett Farrell had this to say in his ‘Running Commentary’ of January 1952 after the Nigel Barge Road Race where he was second and only ten seconds down (24:48 to 24:58) on Andy Forbes: “Binnie whose performance in beating Tracey (third in 25:13) was brilliant, is perhaps reaping the dividend of his sustained consistent training. Zatopek appears to be the model of the young Victoria Park man who runs often and long in the slow fast tempo popularised by the great Czech. At the moment Binnie does not relish cross country regarding which he has a complex: but he is building up to have a real go at the three and six miles track distance later. It will be interesting ti see how he comports himself in the summer.” Complex? Maybe – he avoided the Midland Championship but when the Scottish Championships took place on 1st March at Hamilton Racecourse, he was seventh finisher and second club man behind Andy Forbes (fourth) in the winning team. In 1951 Shettleston Harriers had been runners up in the English Cross country championship after being only second to Victoria Park in the Scottish, so in 1952 the Scotstoun club decided to go down to the event to be held in Birmingham. In short, they went, they saw, they conquered! They won with 241 points against Bolton United Harriers 255. The team captain Andy Forbes knew full well the value of speed in cross country running and had particular knowledge of the very fast start at the English National. So every Sunday they trained at Mountblow Recreation Ground in Clydebank – the home of Clydesdale Harriers at that time. The venue had a 330 yards red blaes track but the grass perimeter was just over a half mile of mainly good but heavy grass running. And they did fast half mile reps. The result was that they coped well with the ‘blitz’ start and finishing positions were Forbes 11, Jimmy Ellis 32, Binnie 41, Chick Forbes 51, Ronnie Kane 52 and Johnny Stirling 54. There are some comments on the economics of the trip below. Ian Binnie was selected for the International Cross Country team that year and finished 62nd and out of the counting team runners. In the Six Miles at the SAAA Championships in June 1952, on a bitterly cold and windy Friday night he won the Six Miles which was reported as follows: “Undismayed by a leg injury acquired in training, which was well strapped, Binnie from the gun was out for a new record. At 5 Miles with 24:59 he had a new Native record (prev. 25:12), but this went unnoticed by all present and at 6 Miles swamped JF Wood’s other Native Record 0f 30:34 with 30:04.2. In the Three Miles on the Saturday he was third behind Forbes and Eddie Bannon of Shettleston in 15:9.1. In August Emmet Farrell, said: “Ian Binnie, our six miles champion and record-holder looks the best prospect of our distance track men. He has his own ideas of training, modelling himself somewhat on the lines of a miniature Zatopek and has even been known to run 12 miles on the day before a race. With added strength and confidence there is no saying to what heights he may aspire. He has his eye on Peter Allwell’s Native Record at two miles of 9:13 odds. After seeing Binnie do a 9:24 recently on a loose track with ease he wouldn’t be far away on say the Helenvale track where the present figures were made.” He finished the season fourth in the Three Miles and top of the Six. Season 1952-53 for Binnie was maybe his best ever. The winter season started without him in the McAndrew Relay and he did not turn out either in the Midlands Relay Championship. Came the Edinburgh to Glasgow Relay and VPAAC were again the winners and this Time Binnie was on the sicth stage head-to-head with Eddie Bannon of Shettleston and he was only three seconds quicker st the end – 33:37 to 33:40. Emmet Farrell had this to say of the race: “Perhaps the finest intrinsic running was that of Ian Binnie’s 33:37 and Eddie Bannon’s 33:40 in the long seven miles stage. Binnie’s time was only five seconds outside Jim Flockhart’s remarkable 1937 record.” In February Binnie turned out in the Midland Championship where he was twenty fourth and last counter in the winning Victoria Park team. On 28th February he ran in the National Championships at Hamilton Racecourse he was eighth and second VP runner with Andy Forbes second. For many however the one hour run at Cowal Highland Games was the highlight not only of the year but of his running career. ‘The Scots Athlete’ again. At half past two on Friday 28th August at Cowal Stadium track, Dunoon, Argyllshire on the first day of the famous two-day Cowal Highland Games, five competitors lined up for the start of a one hour run – the main purpose of which being to give the Scottish distance runner Ian Binnie of Victoria Park AACan opportunity of attacking the Scottish and British records. Binnie’s running turned out to be one of the greatest athletic performances ever seen in Scotland. At each stage from and including 7 miles – 8, 9, 10, 11 and 12 miles and one hour he recorded faster than all previous native and all-comer’s bests in the British Isles and the Empire. He had to contend with a stiff breeze and though the track was in excellent condition Ian felt the effect of the black coal-dust top cutting up and did not think it was as firm as the White City track. he commented on being very badly stitched at around the 4 miles stage and feeling like retiring. His 10 miles time, 50:11, was superb. It broke the British All-comer’s record 50:30.8 standing to the name of Bill Eaton (1936) and far superseded that of any native Scot. He went on to increase the British all-comer’s 1 hour record of Alfred Shrubb (1904) by 435 yards to 11 miles 1571 yards and continued to 12 miles which he reached in 60:34.2 beating the previous British best 62:43 created by S Thomas at Herne Hill in 1892. Though Ian was pleased enough with his collection of records it was typical of him to express his disappointment at not covering 12 miles inside the hour which was his personal target. he now holds every Scottish record from 2 to 12 miles. We give his times at each mile stage along with those of Shrubb who established his in a similar race in 1904. The performances shown recorded by Shrubb were the standing British all-comer’s marks. The 1953-54 season started as usual with the McAndrew Relays at Scotstoun. Home team Victoria Park won their 12 miles relay with a record time of 62:43 which was 55 seconds inside the existing record while Binie broke Eddie Bannon’s individual record which was only half an hour old by six seconds with 15:01. “Emmet Farrell again – “they also easily retained the Dundee Kingsway Relay Trophy finishing first and second teams. By all-round work they had a sound enough win in the Edinburgh-Glasgow Relay although special mention must be made of young Norrie Ellis who built up a winning lead in the 4th stage and of Ian Binnie’s record-breaking sixth stage knocking 11 seconds off Jim Flockhart’s time set in 1937. 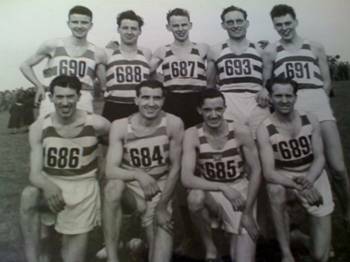 They suffered their only defeat on their only cross country outing so far (December 1953) – the Midland Relay at the hands of close rivals Shettleston Harriers. Starting almost on level terms over the last two and a half mile stage, Ian Binnie was no match for international star Eddy Bannon. Just as Binnie dominates and is such a tower of strength to his club on track and road, so Bannon is for his club on the country.” So no mention of a ‘complex’ by now and in the preview of the National Cross-Country Championships in 1954, Emmet Farrell lists his contenders and outsiders without mentioning Binnie and then comes “The Position of Binnie: I did not discuss Binnie’s prospects for the simple reason that the Victoria Park crack is allegedly not interested in selection for the International and may prefer to make a sterner bid in the English National a week hence. Yet he is keen to help his club to another National team title and if he does not rate as Bannon’s chief rival for the title he should easily find a place in the top six.” Binnie had not run in the District Championships where his club was again victorious. Well, Binnie did run in the National but he did not ‘easily find a place in the top six.’ He did not even find a place in the VPAAC top six – he was thirty ninth and seventh club finisher in a race where Shettleston Harriers won by 23 points. In the June issue of the ‘Scots Athlete’ there is a preview of the up-coming Scottish Championships with a section headed “Can Binnie Retain His Two Titles?” Which goes on “Last year Ian Binnie literally ran away with both 6 miles and 3 miles and of course set up native and all-comer’s records in the process. His recent form has been erratic and somewhat disappointing. His hour run while good enough was not the Binnie standard and the Victoria Park crack is not regarded as certain to win both titles. I find it difficult to oppose this mercurial but brilliant runner who by the time of the championships may have recaptured some of last year’s effervescence. In the 6 Miles I see little opposition if Binnie is in good form. Harry Fenion who is running well and Hamilton Laurence of Teviotdale should take place positions. Binnie may have a harder task to retain his 3 mile title. Chief opposition may come from little John Stevenson of Greenock Wellpark who has been showing excellent form over 1 and 2 miles. Other likely candidates are Eddie Bannon, our cross country champion, Alex Black, now at Dundee, Springburn’s Tommy Tracey and Englishman Adrian Jackson. If they are all lined up at the start what a thriller it will be all the way.” The Scottish rankings at the beginning of May that year had Binnie second in the 3 miles with a time of 14:17.1 against John Stevenson’s 14:13.4 – Stevenson also topped the Mile list with 4:25.6. Came the championships with the 6 miles as usual on the Friday night. “Wintry conditions prevailed. Ian Binnie was in great form for though admitting after the race to being continually blown off the track when against the wind he broke his own native record (19:28) and Paavo Nurmi’s 1931 all comer’s mark (19:20.4) at 4 miles and his own all-comer’s records (24:24.1 and 29:20.7) at 5 and 6 miles. It was a superb effort.” He also won the 3 Miles in 14:19.6 from Eddie Bannon (14:33.6) in a field of 20 runners. By the end of June he led the rankings at 2 Miles (9:11), 3 Miles (14:04), 6 Miles (29:20.7). As a result of his two wins he was selected for the Empire Games in Vancouver where every event was overshadowed by the Jim Peter marathon (see Vancouver 54 elsewhere on this website) and the Bannister/Landy Mile. However Binnie was selected for both Three and Six Miles and competed in both. There was very little coverage but he was seventh in the Three Miles in 13:59.6 and sixth in the Six Miles in 30:15.2. The Three Miles time made him the first Scot under 14 minutes for the distance. The 1954-55 season saw a change in the usual pattern when Shettleston Harriers won after five years of Victoria Park triumphs. Binnie started off on the last lap behind Joe McGhee and although he ran a brilliant new record of 14:58 for the course he could not catch McGhee who only ran 15:33. The pattern of recent years had changed to such an extent that Shettleston were first, third and fourth! In the Midland Relays, the result was the same with Binnie running 16:51 for the first lap. However when the Edinburgh to Glasgow Relay was run, Victoria Park again triumphed for the fifth successive year and with a new course record and Binnie set a record of 33:21 for the sixth stage where Joe McGhee was second quickest with 33:51. He turned out for his club again in the Midland District Championships where they were second to Shettleston and Binnie was thirty first and fifth club runner. The team result in the National – again at Hamilton – was the same despite Donald Henson of VP winning and Binnie finishing fourth – his highest ever in the National. In the annual preview of the SAAA Championships in the June ‘Scots Athlete’, the headline wasIan Binnie hot “Double” Favourite. The article read: After his brilliant 3 miles of 13:54.8 at Ibrox, Ian Binnie looks set to retain both 3 and 6 Miles titles. Despite being unable to hold his killing opening pace and fading somewhat, Binnie must be congratulated on his wonderful time and after all, only Dunkley passed him on his way to the tape. He kept his promise of running the race of his life though doubts concerning his tactics still prevail. Modern standards are emphasised by realising that Binnie’s time was practically identical with that of Sydney Wooderson’s in his famous classic with Willie Slikhuis in 1946, and Dunkley best known as a miler did his 13:50.3 3 miles as an experiment and may try for top honours in the steeplechase because the mile and 3 mile fields are over-crowded with brilliant exponents. The report of the Championships said that Binnie won both races ‘creditably enough’ although not up to his usual standard but praised Andy Brown for pressing hard in both races and emerging with two second places. The report on the 6 miles started as per usual by commenting on the windy Friday night for the race. A fast start saw the one mile in 4:32 with Brown following closely but he was shaken off during the second mile (9:17.4) at which point the pace slackened with Ian winning in 29:40.4. Victoria Park regained the McAndrew Trophy in October 1955 taking 15 seconds from the record for the race and Binnie? Well the report was that where Binnie gave Joe McGhee a start on the last leg again, this time he was closed down very quickly and Binnie brought the club home victorious. Binnie was 15:02 and McGhee 15:32 and the club difference was only 5 seconds! Shettleston got their own back when they won both Midlands Relay and the Edinburgh to Glasgow. In the Midland Relays the Victoria Park A Team could only finish seventh with Ian Binnie running second and his run in the ‘News of the World’ was ‘non-vintage Binnie’ although he did have the second fastest time only seven seconds behind Bannon. Bannon was 33:50 with Binnie 33:57. In the annual Morpeth to Newcastle race Ian was fifth after leading for most of the way. Emmet Farrell reported that it was ‘definitely not Binnie at his brightest’. Binnie missed the Midlands Championships where VP were fifth despite John McLaren winning the race. He was back in cross-country mode for the National where his club won from Shettleston and Binnie was eleventh. The answer came three months later when the cover picture of the magazine had Ian picture with the caption: “After a record run leg in the VP Road Relay, Ian Binnie finishing for Victoria Park AAC who won with a new course record.” Ian’s own run on the last leg against Graham Everett of Shettleston saw him start with a lead and set off in ‘his usual hurricane fashion’ but Everett had no intention of letting him go and by one mile, had the lead down to five yards but with a mile to go Binnie was moving away again and although Everett came back at him, Binnie moved away and won with a record time. Then in November VPAAC won their sixth Edinburgh to Glasgow and Binnie on the sixth stage had the fastest time by just over a minute but was well outside his own record time ( 33:20 v 32:32.). He turned out for the club in the National Cross-Country where he finished fourteenth for the team which won with 93 points against Bellahouston’s 125. In the summer of 1958 he became the first Scot to run inside 14 minutes for the Three Miles when he won the Scottish Championship in 13:57.6 and that was to be his last championship and his last record. He went on running until into the twenty first century but there was very little racing in there after 1958 although he was an easily recognisable figure running along the Great Western Road with his vest squashed up in his hand. His interest in the sport never waned – when the Kelvin Hall had its track relaid in the early 2000’s he took some of the off cuts to examine them and we discussed the composition of the track. We had a chat one afternoon at the side of the road at the start of the McAndrew Relay where he had been such a star – and nobody interrupted us – no one recognised the spare, fit figure with the rucksack watching his club running round the familiar roads of Scotstoun. When he died in 2007, Doug Gillon, who had been a runner for the same club at one time wrote the following obituary in the Glasgow Herald on 4th August 2007. Athlete:: born July 15th 1929; died July 26th 2007. Ian Binnie who has died suddenly aged 78 was the greatest Scottish endurance runner of his generation with ferocious work ethic which to his death he played down. In 1953 Britain had just lost the six miles in the international match against Germany when Norris McWhirter, of Guinness Book of Records fame, told the London crowd at the White City that a man who had turned down the chance to represent his country in that event that very afternoon had just broken two British records, the Empire record the UK All-Comers record plus six Scottish records in the same race “…. running, if you please, at some place called Cowal.” That man was Ian Binnie who always used to insist that “I was just a very lucky boy.” So ‘lucky’ that he broke 21 Scottish records during his career. He held the course record in virtually every Scottish road race. Binnie was certainly blessed with talent. Brought up in Oxfordshire by his grandparents because his father, John. was in India with the Foreign Office, Binnie excelled at cricket and had trials for the county before he moved north when the family returned to his parents’ native Glasgow. He came late to athletics but soon made a prodigious impact. He borrowed from the harsh regime of the Czech master Emil Zatopek who had won three Olympic titles in 1952. Binnie would run up to 40 laps, sprinting for up to 300 metres then jogging 100. No Scottish athlete had tried anything so extreme and it soon paid dividends. The Scottish All-Comers mark for Six Miles had stood to the legendary Alf Shrubb since 1904 when Binnie wrote it out in 1953. Then he paced Gordon Pirie to a World Record in the Six Miles at the AAA’s Championships, setting a Scottish best of 28:53.4. Apart from Andrew Lemoncello who runs in the World Championships this month, no Scot has run that fast this century. On the Cowal cinders that day in the summer of 1953, Binnie broke Scottish records at seven, eight, nine, ten and eleven miles, plus one hour (he covered 11 miles 1571 yards, narrowly missing the World Best with the third furthest ever. ) His 10 Mile time was a British record, and his one hour one was an Empire and UK All-Comers one. Binnie went to the Empire Games in Vancouver finishing seventh in the Three Miles and sixth in the Six Miles. he was the first Scot to break 29 minutes for the Six Miles, 14 minutes for the Three and 9 minutes for the Two. He won the Three and Six Mile double at the Scottish Championships for three successive years. This gained him the prime Scottish Trophy, the Crabbie Cup. The last person to win it thrice consecutively had been Eric Liddell. Binnie was fiercely proud of his club, Victoria Park, and helped them to a unique record. In 1952 he was a member of the Scotstoun club’s team which became the first from outside England to win the English National Cross Country title. The team of nine wo travelled to Birmingham included Empire Games medallist Andy Forbes, and his brother Chick, Ronnie Kane, Bobby Calderwood and Alex Breckenridge who later served two tours as a major in the US Marines in Vietnam. The whole trip including the railway return cost £65 including one guinea a head for bed and breakfast for all nine athletes. These stalwarts monopolised the Edinburgh to Glasgow Relay in the 1950’s. One year Binnie arrived wit the trophy which had a silver running figure on the top. He had knitted kit for the figure in his club’s blue and white. They duly won again. Binnie was an engineering draftsman, mainly in Babcock’s. A non-smoker he ran regularly until a year ago, always with a stopwatch. But lung cancer, apparently asbestos-related, was diagnosed and he died at his home last week.